Our Wednesday Night bible study at Asbury is one of the highlights of my week. It’s always a fun time of conversation about scripture, life, and what God is teaching us. We laugh, ask questions, and try to dig deep into God’s Word. Now, notice what I did first. I didn’t just include that verse, but I included the verses after it, and I could have included the verses in front of it. One of the most important things we can do when we read the bible is to understand context. What is happening before the verse, what is happening after the verse. You don’t just want to look at one passage but look what’s happening around it, to get the full picture. Jesus said, don’t judge, so you won’t be judged. How we judge others will be how we are judged ourselves. Then look at what happens. Your neighbor as a speck (a small thing), while you have a log (a large thing). 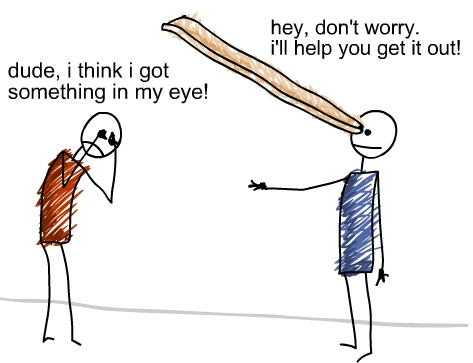 Take the log out of your eye. Why? So you can help your neighbor take the speck out of their eye. I think this passage teaches at least two things – humility. We are no better than anyone that we may want to “judge.” We are human. We have made mistakes. We have failed, we have major things that we have done. We need to always understand that as Christians, we are not better than anyone else. We are simply sinners saved by grace. We have to approach everything with humility. That’s the only way that we can make a difference, the only way that we can help others. Understand your weakness and sin, own it, and when you do that, you will really be able to help others with their weakness and sin. We have to understand and live out humility in everything. The second thing is this – the point of “judgement” is heal others. To help others. We are never to judge. We are to help. If someone you love is doing something wrong, you job is not to beat them up, but to help them come to healing. To restore them. To love them. To help them to be complete. You never want to beat them up. But you do, through love, want to help others (just as you would want them to help you) come to a healthy and whole place in their life. And sin, in the end is destructive. Destructive to our walk with God, and our walk with each other. That’s why our log, and their speck, must both be removed, so what we can walk in peace with God and each other. Sin destroys, and God desires healing and wholeness for all of us. That’s point here. Not judgement. But healing. Forgiveness. Restoration. So, yes, help your neighbor with their speck. But first, humbly look for the log in your own eye. And then, let every action, every word, every thought you take for them by about what is best for them, and be about loving them, as Jesus loved them.